Keeping a Marine Aquarium involves a lot of balance to keep the environment at its best for the delicate fish inside. Just one part of this balance is effective filtration for waste removal. 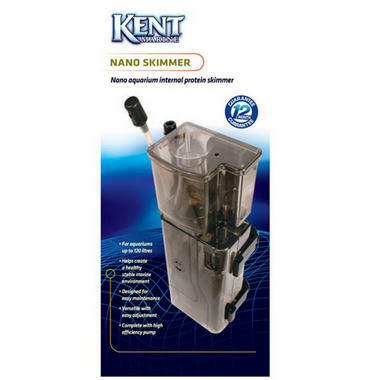 The Kent Marine Protein Skimmer is a useful tool in any Marine based system. Dissolved in the Marine water is the waste and protein fragments that are regularly produced by the fish in the aquarium. The waste soon accumulates in the tank and will start to break down into harmful chemicals. Marine Water is unique in that you can create tiny bubbles within it. The waste products and proteins will stick to the surface of these tiny bubbles. As the bubbles rise in the skimmer body they will take this waste with them and when the bubbles reach the neck of the skimmer they are concentrated and the bubbles collapse on each other. This forms a brown and protein rich foam which exits the neck of the skimmer and into a collection cup where it can be easily removed. The Nano is a compact skimmer that can fit into any size filtration systems and aquariums. Having a protein skimmer as part of your Marine set up adds additional benefit to the filtration system as it reduces the work load on the filter and helps to create a stable marine environment that is rich with clear and healthy water.